I am a big fan of making sure that nothing gets wasted. From a pragmatic standpoint, I spent good hard earned money on it so I don’t want to waste. From an environmental and moral standpoint, I can’t justify in my mind wasting food when others could really use it. So I try to figure out ways to make sure I use what I buy. I’m not always successful but I sure try. Bananas that are going bad makes great banana nut bread. Apples that are getting soggy can be turned into awesome apple sauce or used as a non-fat fat substitute in baking. 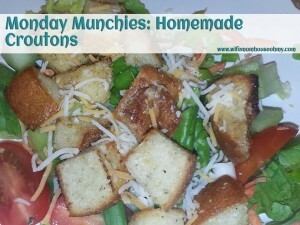 Bread that is getting stale is a perfect ingredient for homemade croutons. Seasoning – popcorn flavored seasonings such as ranch or white cheddar, garlic powder and salt, Italian seasoning, salt, onion powder and onion salt, etc. 1. Cut stale bread in to cubes. Use a serrated bread knife so the cubes stay fluffy and do not rip or flatten. 2. Preheat oven at 400 degrees. 3. Place cubed bread into ziplock bag. Add seasoning – approximately 1 teaspoon for every three cups of bread and approximately 1/8 teaspoon of salt for every three cups of bread. Seal the bag and shake until bread is coated. 4. Pour warm melted butter into the ziplock bag. Seal the bag and shake making sure every piece of bread is well coated with butter. 5. Spread out evenly in one layer on a baking sheet. Bake until slightly golden brown. Using tongs, flip bread so the other side is exposed. Bake until this side is slightly golden brown. 6. Switch oven to broil and cook until croutons become golden brown and stiff/crispy to the touch. 7. Cool over night in the open on a baking rack to completely dry out. 8. 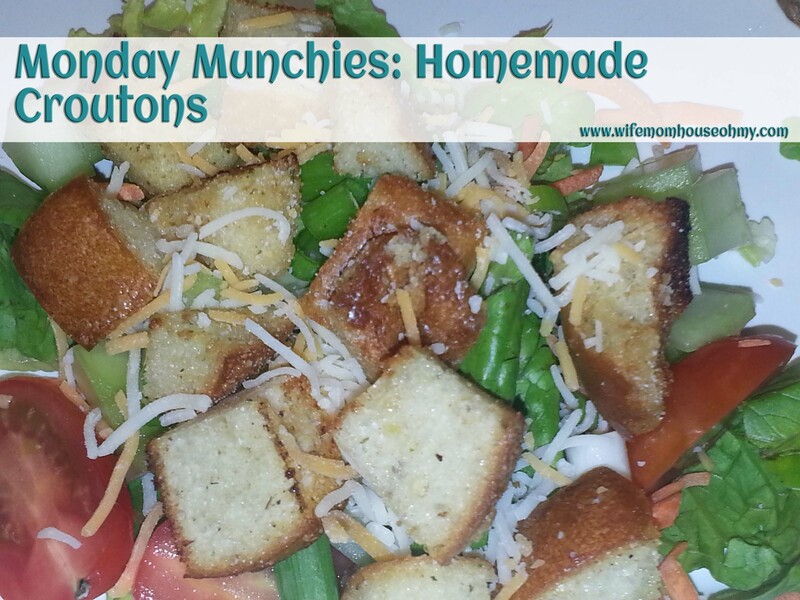 Serve over salad, soup or just enjoy on your homemade croutons on their own. Place remaining croutons in a brown paper bag. They will keep for about one week store in the refrigerator.